Tout Draft Archives | TOUT WARS! 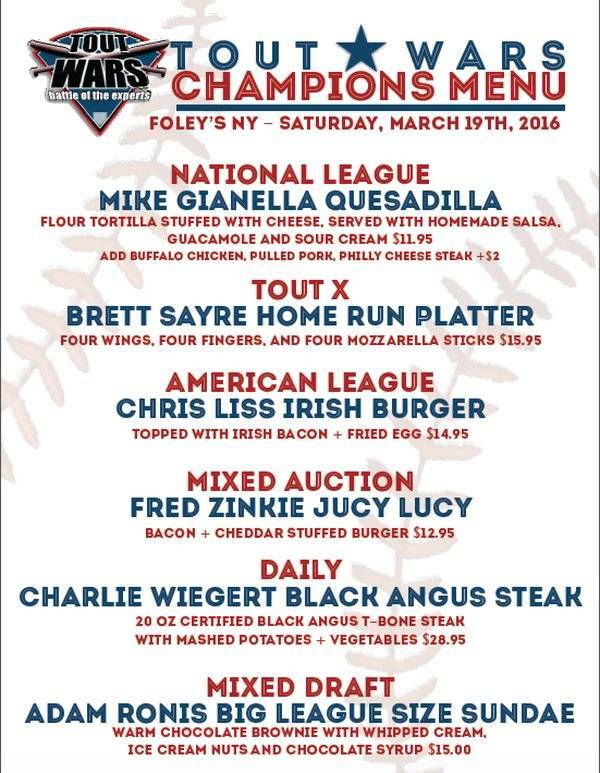 Tout Mixed Draft Winners! Preseason Style. 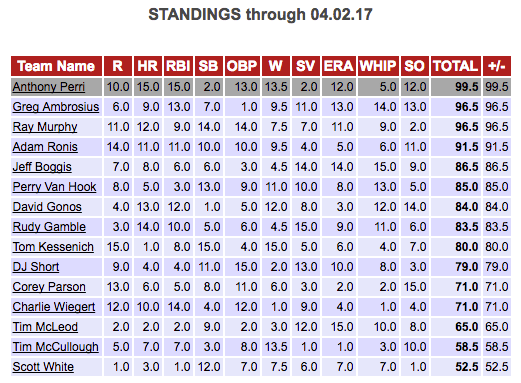 Our stat provider, onRoto.com, has a feature that allows us to apply two sets of projections to the current rosters, and see the year’s “final” standings before the season even starts. 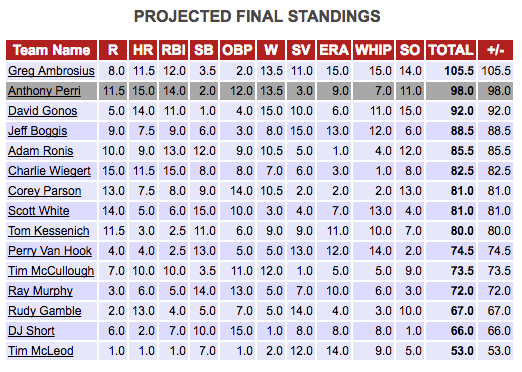 It’s probably a comfort to two-time defending champ Adam Ronis (and everyone other than Ambrosius, Perri and Murphy, that last year’s projected standings had him finishing 10th and ninth respectively. That’s why we let them play. 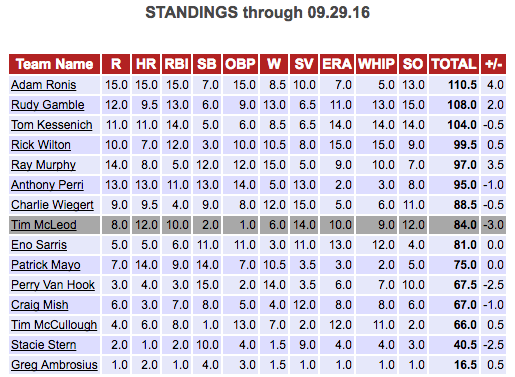 Adam Ronis Wins Tout Wars Mixed Draft! Again! 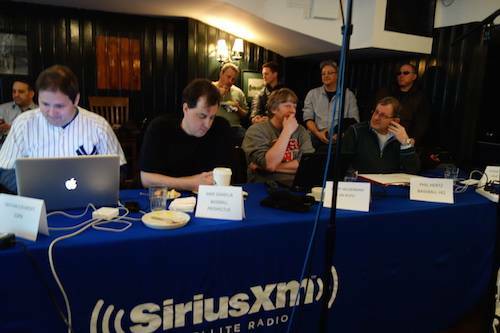 Rudy Gamble finishes second in Tout Wars Mixed Draft! Again! On the hitting side, these leaders are mostly set. There are no hitting points for Ronis to easily win or lose. Gamble could gain half a point in homers, or lose up to two and a half points, while he could gain a point in OBP, or lose two. Clearly a good weekend with the bat is important to him. Kessenich has no offensive downside, and has the chance to pick up two points in OBP. Things are considerably more complicated with the pitching. Ronis and Kessenich are tied in wins, so either could gain half a point (or lose half), but they are just one win ahead of Tim McCullough, who has four starts this weekend. Ronis and Kessenich both have four likely starters, too, but one of Ronis’s is Noah Syndergaard, whose Sunday start will be limited to 25 pitches if the Mets have clinched the wild card slot. 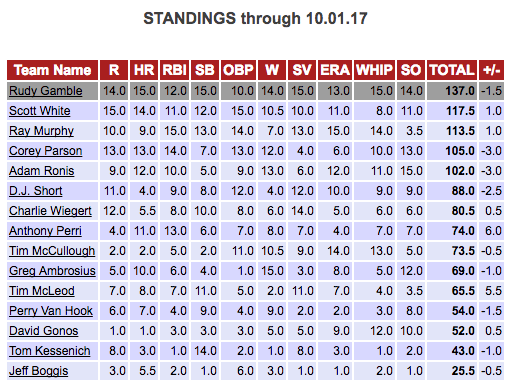 Ronis can also earn a point in Saves and another in WHIP, but could lose have a point in Saves, three big points in ERA and another in Strikeouts. He’s up eight strikeouts over Tim McLeod, but McLeod is making five starts this week, so Thor’s short stint on Sunday could come into play here, too. Gamble and Kessenich are fighting in Saves, tied with 69, and can gain or lose half a point, and within .0004 in WHIP. Gamble is the trailing team, and can add a point while costing Kessenich one. Finally, Gamble could gain or lose one point in ERA, while Kessenich has a point to lose there. 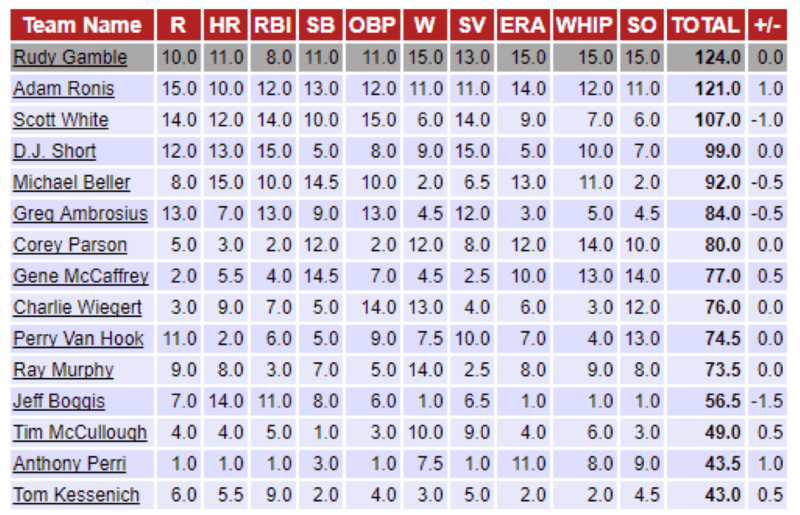 It looks like good pitching could be the differencemaker this weekend. Adam Ronis, last year’s champ, has 110.5 points. With his best weekend he could end up with 113 points. With is worst? 104.5. Rudy Gamble, last year’s runner up, has 108 points. His best? 112. His worst? 102 points. 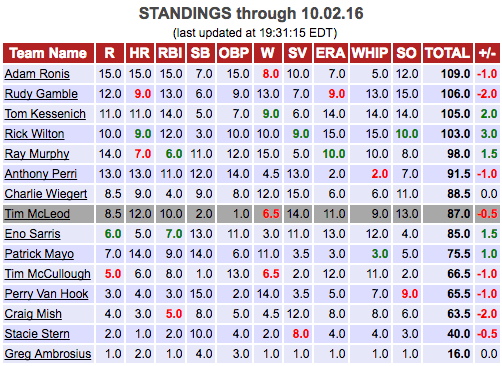 Tom Kessenich, who finished near the bottom last year, has 104 points. Best? 107 points. Worst? 98 points. He’s got a tough job to pass two teams ahead of him.